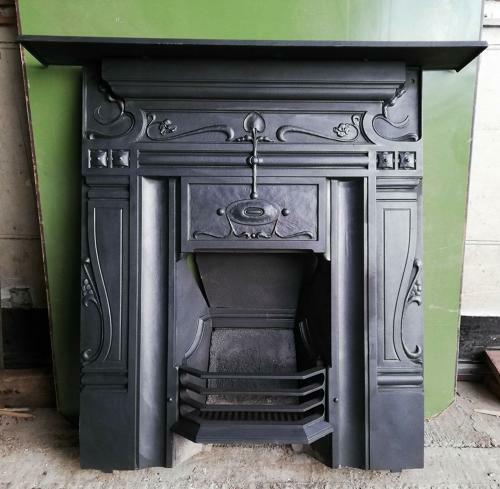 A particularly fine example of an Art Nouveau cast iron combination fire. The body of the fire is approximately 35", ideal for a living or dining room. The fire has the original flared smoke hood with an attractive design, typical of the period. The fire has decorative borders and Art Nouveau flowers. The shaped front bars are present. The back has a registered design number, RD372087, dating the fire to 1900-1909. The iron has been blacked and polished giving the fire a good finish. There are two holes for fixing screws on each side of the fire body and the mantel has lugs that can be fixed in to the wall. The fire has some slight signs of wear as expected of antique items. There are some small casting marks and scratches. The back has surface rust and there are some very small patches of surface rust to the grill. The concrete fire back has some cracks. The mantel has some small casting holes. The fire would add a great deal of period charm to a home and is a very desirable and finely made fire.